Abang Johari (centre) presents the federation’s award to Lau (second right), as (from right) Wee, Tiong Hook and the federation’s vice-president Tan Jit Kee look on. KUCHING: The Federation of Kuching, Samarahan and Serian Divisions Chinese Associations Sarawak has called upon Sarawak United People’s Party (SUPP) and United People’s Party (UPP) – both predominantly-Chinese based parties – to unite as one and create a single strong voice for the Chinese community. Federation president Dato Richard Wee points out that the Chinese have been feeling the strain of the division between the two parties since the last state election, which is said to have weakened the Chinese participation in the state government. “Being the oldest political party in Sarawak, SUPP has its illustrious past and its historical value. 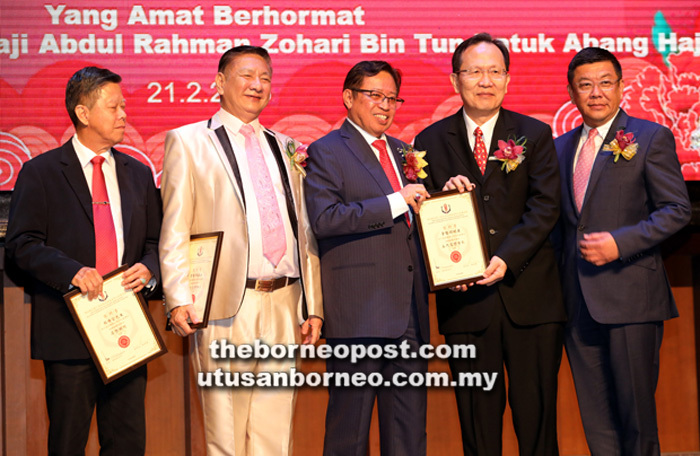 Hence, for UPP to return to the SUPP fold – this would definitely strengthen the base and its representation, and with a united SUPP, they will be able to be a more effective member in our state government and also the state Barisan Nasional (BN),” he spoke during the Chinese New Year 2018 celebration at Imperial Hotel here on Wednesday night, where Chief Minister Datuk Patinggi Abang Johari Tun Openg and his wife Datin Patinggi Dato Juma’ani Tuanku Bujang were the guests-of-honour. The event also hosted the federation’s 39th anniversary dinner. Minister of International Trade and E-Commerce Dato Sri Wong Soon Koh, who is also UPP president; and Minister of Local Government and Housing Datuk Dr Sim Kui Hian, who is also SUPP president, were among those present. Adding on, Wee believed that it is also imperative that UPP’s return to SUPP would ‘be welcomed wholeheartedly’ by the leadership of SUPP and its members. SUPP, he emphasised, must display sincerity, genuineness and willingness to show inclusiveness in coming together as one party to further strengthen its representation of the Chinese community. Both parties, he added, must put aside past differences and focus on the greater unity of the Chinese community. “We sincerely hope that the leaders of both parties would respond positively to the call of the Chinese community, which you all represent,” he stressed. Sarawak, Wee emphasised, is blessed with unique traditions as the people truly practise racial harmony, cultural understanding and religious acceptance – such values are now the envy of ‘our Semenanjung (Peninsular Malaysia) brethren’. In this regard, Wee proposed for a ‘Unity Night’ to be hosted by different racial-based associations on rotational basis. Unity Night is usually held in connection with Sarawak Day on July 22. Wee also said the federation was pleased that since becoming the chief minister, Abang Johari has not only continued the policies laid down by his predecessor, the late Pehin Sri Adenan Satem, but has further expanded them by taking Sarawak to the forefront of modern technology and new economy. for Sarawak and Malaysia Agreement 1963 (MA63) are the closest to the people’s hearts. Wee also took the opportunity to convey his appreciation and gratitude for contributions by the federation’s immediate past president, the late Temenggong Lu Kim Yong; and its honorary life president, the late Chai Tze Khin. “It was through Temenggong Lu’s tireless efforts that we now have our own building today. “The late Mr Chai was among the pillars of our society, especially the Chinese community. He had generously donated RM1 million for the federation’s building fund, among his other immense contribution. “Their untimely passing is a great loss to the Chinese Community. We are, however, inspired by their spirit, and we hope that with such guidance, we would be able to serve our community better and hopefully, to be able to take our federation to greater heights,” he said. The event also held the presentation of the ‘Honorary Life President Award’ to KTS Group of Companies managing director Datuk Henry Lau. Minister of Tourism, Arts, Culture, Youth and Sports Datuk Abdul Karim Rahman Hamzah, Assistant Minister of Transportation Datuk Dr Jerip Susil, Padawan Municipal Council chairman Lo Khere Chiang, China deputy consul-general in Kuching Zhang Yang, the federation’s deputy president Wong Tiong Hook who was also the event organising chairman and its executive advisor Michael Teo, were among those present.